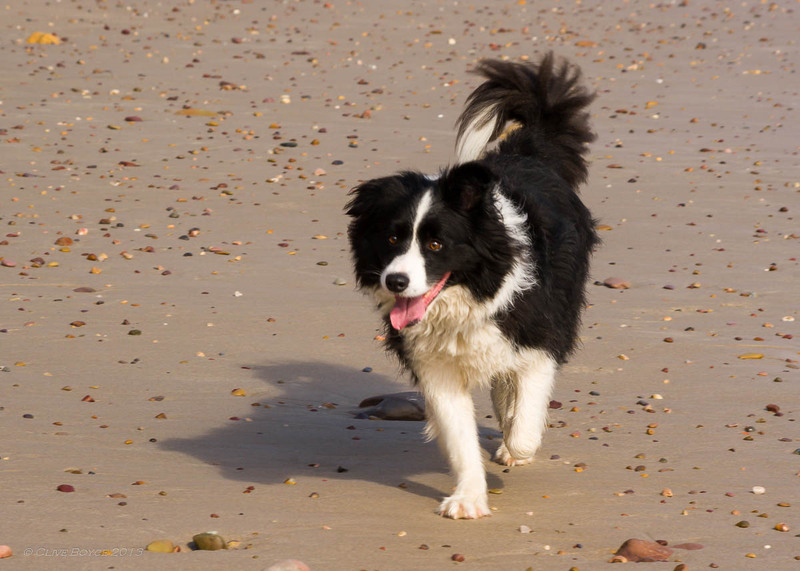 Was down at Sellicks Beach recently, taking my woofa for a run off the leash. 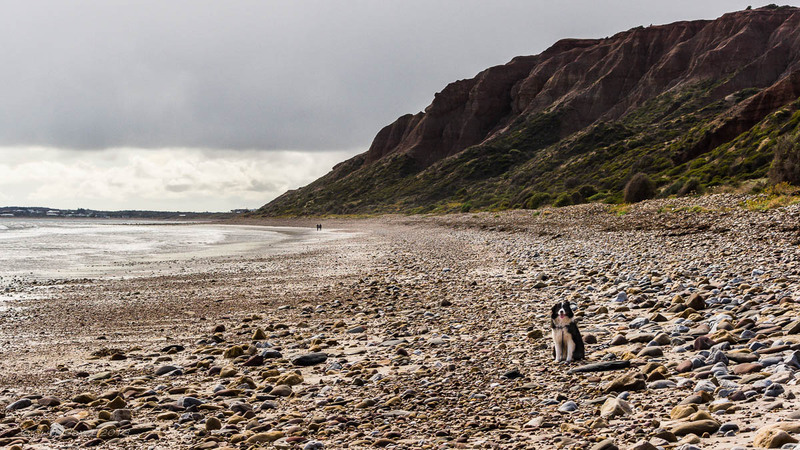 He doesn’t take kindly to other dogs, so I take him to some of Adelaide’s less frequented beaches (and generally on a so-so weather day to further ensure I can get some beach to myself). The beach wasn’t too attractive on this visit, being somewhat scoured out by recent winter storms and with a heap of sea-grass piled up on it. So the camera didn’t get pressed into use. It did remind me though that I took some shots on a trip down that way last winter which I’ll share now in this post. 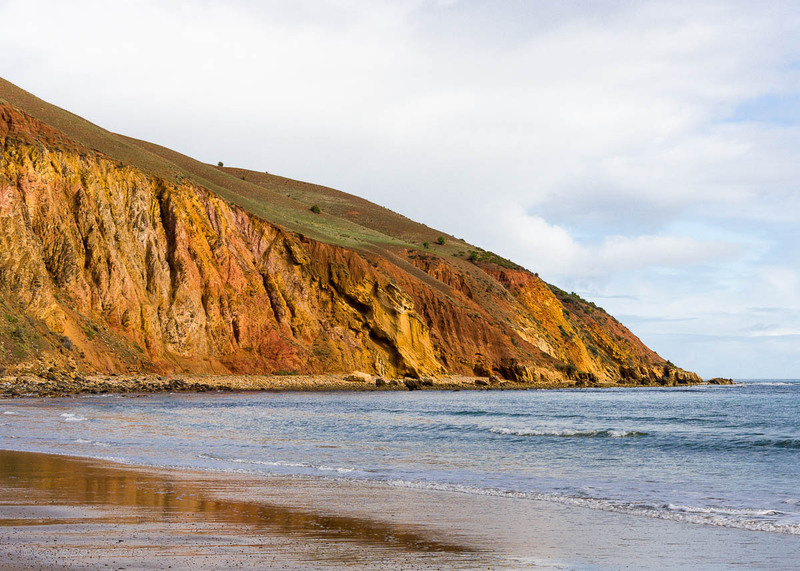 Sellicks Beach is the point where the southern Mt Lofty Ranges meet the sea, and the hills often generate light showers as clouds roll in off the sea. 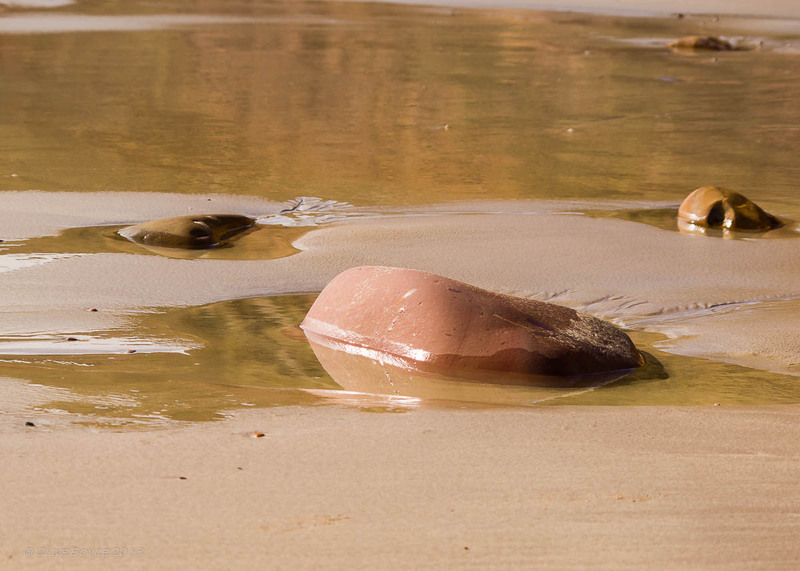 This was one such day, but with the photographic bonus that the beach itself remained bathed in sunlight. And rather than my usual Tamron 17-50mm lens, I plonked on a Pentax DA 55-300mm telephoto zoom to seek a somewhat different look. 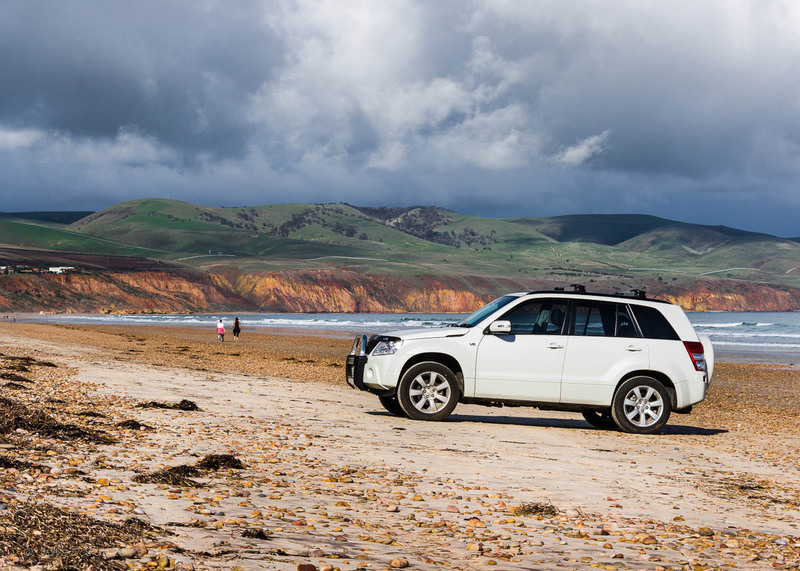 The mid South Coast beaches allow cars to be driven on to selected sections of beach, and in summer time, are popular spots to set up for the day. Not all pebbles are born equal! 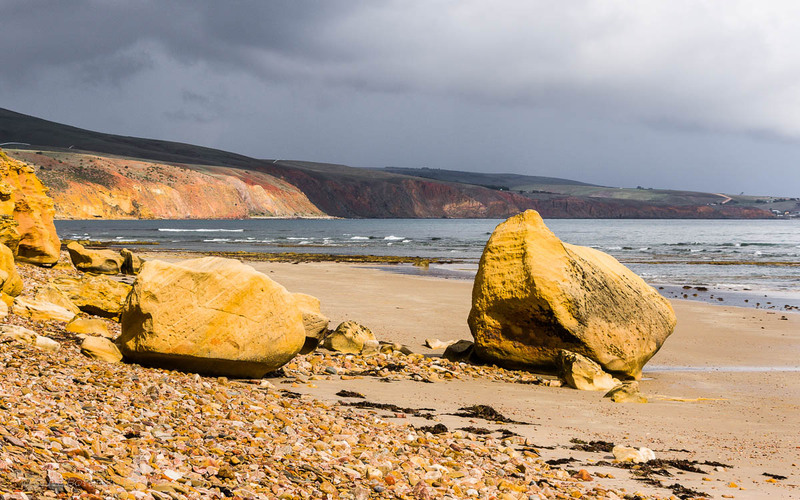 Adelaide’s beaches are generally stone free, but at Sellicks, erosion of the cliffs provides an ongoing supply of debris. I wasn’t the only dog walker on the beach. The rich tones of the earth and sandstone cliffs really stand out after a rain shower. Off leash at last, and aren’t I a pretty boy? Dog to Owner: Enough of trying to be creative with that damn camera! 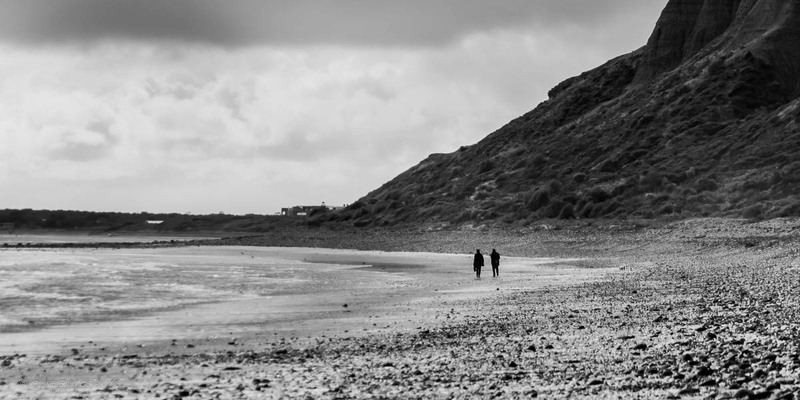 Conversion into B&W and you could be on a windswept Scottish beach …or at least what I imagine a windswept Scottish beach might look like. Sellicks Beach is a 45 minutes drive south from the centre of Adelaide. 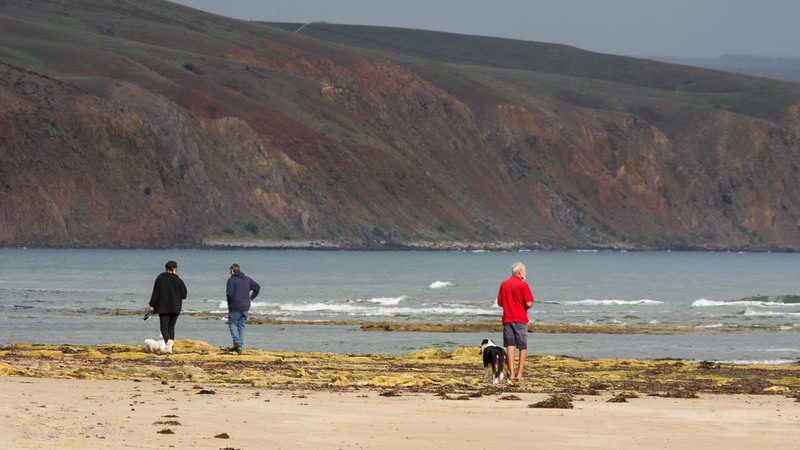 It forms the southern end of a series of popular beaches – Moana, Maslins, Aldinga, Silver Sands and then Sellicks. It also marks the southern end of what would be considered the greater Adelaide area. This entry was posted in Adelaide, Places to Visit and tagged Adelaide beaches, Fleurieu Peninsula, Photography, places to visit, Seascapes, Sellicks Beach on August 26, 2013 by aussiesouthlander.